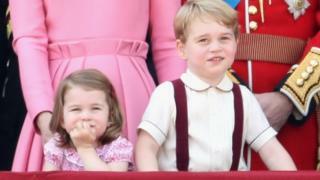 For Prince George and Princess Charlotte such trips are a novelty but, as the future of the British monarchy, they'll one day become a way of life. For their parents, the visit to Poland and then to Germany will inevitably be viewed in the context of Brexit. It won't have any impact on the negotiations. It will, the Foreign Office hopes, remind people of the strength of the ties that will endure after the UK has left the EU. It's this mission the royals have pursued in recent months in various European cities. This week, in Warsaw and then in Gdansk, Prince William and Kate will be reminded of Poland's recent turbulent history. They'll meet survivors of a concentration camp; veterans of the 1944 Warsaw Uprising against the Nazis; and some of those who were part of the Solidarity movement that eventually led to the collapse of communism. In Germany, Chancellor Angela Merkel will hold a private meeting with the royal couple in Berlin before they visit the Brandenburg Gate, a symbol of German unification. The Duke and Duchess of Cambridge will also visit Berlin's Holocaust museum and memorial.